Biological systems are not static. Thus they can be engineered to account for changing environmental conditions, as we've seen through our examination of two component regulatory systems. In addition, they can be engineered to account for changes that occur as the cells replicate and divide over time. Indeed, evolution of biological systems away from an original specification can be viewed as a curse (it's not like computer scientists have to worry that their software programs change functions when they relaunch them!) or a blessing (evolution can find a solution we didn't ever dream of). Here we'll take the rosy view and try to harness genetic variability to improve the bacterial photography system. In particular we'll screen a library of changes in the Cph8 gene to find ones that increase the phosphatasing activity of the sensor when the cells are growing in the light. The mutants (we'll call them P+) should make the "light" color of the photographs more light by decreasing the amount of phosphorylated OmpR that stimulates LacZ transcription. The region of the Cph8 protein to focus on for this purpose has been defined through traditional scientific studies of EnvZ, for example the work from Tom Silhavy's lab( PMID: 9721293 and pdf here). We've also been guided by the expertise of MIT's Mike Laub, whose lab studies the specificity and rewiring of two component regulatory systems. From these sources, a span of 5 contiguous amino acids can be identified as relevant for shifting the balance of EnvZ to greater kinasing or greater phosphatasing activity. These five residues in EnvZ are Alanine at amino acid 239 ("A239") through Histidine at amino acid 243 ("H243"), where mutations in the flanking residues (A239 and H243) have been shown to enhance the phosphatase activity of EnvZ and mutations in the internal residues (G240 V241 S242) enhance the kinase activity of EnvZ. The amino acid changes that modify the enzymatic activities are indicated on the figure below. Two important notes about these mutations though: First, the balance of kinase to phosphatase activities have been affected by the changes, but the mutations do not shift the reactions to fully "on" or fully "off." Second, the fusion protein of Cph1 to EnvZ, called Cph8, changes the numbering of the residues, as shown in the figure below. It's hoped, however, that the local environment of the region is similar to the natural EnvZ protein. To complement the genetic approach for solving biological engineering puzzles, we'll also consider three more approaches in synthetic biology. The first is a Registry of Standard Biological Parts, essentially a community resource that has some ready-made and useful genetic elements that can be assembled into synthetic biological devices systems. The second approach is to recapitulate the genetic network of the biological system using electronic components, making explicit some of the benefits and limitations of such an approach and the often-cited analogy between building with biology and building with computer programs or electronic components. The final approach is the one you started last time, namely the use the Tinkercell computer model to simulate the behavior of the bacterial photography system, with the goal of performing "in silico" experiments that would take days or weeks to do at the bench. Before you leave today, you should examine the bacterial photograph you set up last time and document your work and your ideas about the experiment. The details for how the libraries were constructed and what kinds of changes are reasonable to expect will be considered in the next lab session. For today, you will transform a pool of DNA with degeneracies in the positions that affect the kinasing and phosphatasing activity of EnvZ. The recipient bacterial strain is identical to the bacterial photography system except that it does not harbor a plasmid encoding the light-sensing fusion protein Cph8. It does encode the OmpR-regulated LacZ gene as well as the phycobilins from a plasmid. To carry out the transformation you will try your hand at a different technique for getting DNA into cells, namely electroporation. This method involves exposing a small but dense volume of cells to a pulse of current. 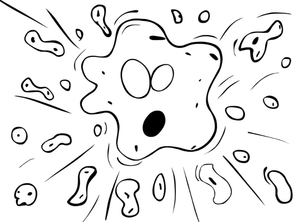 The pulse momentarily opens small spaces in the lipid bilayer for the DNA to pass into the cells. As you can imagine, the cells aren't fond of such treatment, and the single most important step to help them recover is to quickly add media to the cells once they've been electroporated. The process is also very sensitive to salts in the DNA, and if you pipet too much DNA on to the cells, the extra salt may cause an electrical "arc," (you'll know this has happened from the flash of light and the "pop" you'll hear) frying the cells dead. If this happens, please get another aliquot of cells from the faculty and try the electroporation again, with less DNA. Final bit of advice: the "beep" that the electroporator makes to tell you that it's done is relatively quiet so listen carefully for it. When you are ready to electroporate the library, retrieve an aliquot of cells from the teaching faculty, a sterile cuvette, and an aliquot of rich, pre-warmed "SOC" media. Put the cuvette on ice. Pipet 2 ul of the library DNA (library = 0.4 ug/ul) that is being held in an icebucket on the teacher's bench into your aliquot of cells. Let the cells and the DNA incubate on ice one minute. Transfer 50 ul of the cells (or more if the tube has more volume) to the chilled cuvette and recover it with the blue lid. Tap the cuvette on the bench so the cells rest in the bottom of the cuvette. With the cuvette's "nub" facing away from you, slide the cuvette into the electroporation chamber. Push the slide into the chamber until the cuvette is between the metal contacts. The lid on the cuvette will seem to block the path but in fact, it doesn't block the slider if you've lined thing up. Make sure the electroporator is set to "Ec2"
Hold the pulse button until you hear a beep. Listen carefully since the beep is not loud. Quickly remove the cuvette from the holder and immediately add the 0.5 ml volume of "SOC" media to the cells. Delaying this addition by even 1 minute has been seen to decrease transformation by 3 fold. Transfer the cells and the media back to an eppendorf tube and place the tubes on the nutator in the 37° incubator for 1 hour. During this incubation you can work on Parts 2, 3 and 4 of today's protocols. Spread 20 ul of the electroporation mix onto a Tetrazolium+Cam34+Amp25+Kan10 petri dishes. Plate 200 ul of the electroporation mix on another Tetrazolium+Cam34+Amp25+Kan10 petri dish. One of these two dilutions should have single, well-isolated colonies to examine next time. Incubate the plates at 37° in the light until next time. What would it take to make DNA serve as a low-level programming language so that a genome is simply a particular program? DNA, like software, has an alphabet but with only four letters in the genetic code. Since there are proof-reading mechanisms in the "hardware," i.e. in the cell, syntax errors may be less likely to arise than in Python or Perl or C++. The code for cellular programs is messy but, honestly, so are computer programs. Subroutines are often dependent on one another (the cell cycle and DNA replication for example) and parts of the program get reused in useful, but complicated and unpredictable ways (seen as cross-talk in signaling pathways for example). Genetic code and computer code are both susceptible to viruses that highjack normally benign functions. The analogy of the DNA as computer code is not perfect. We have to set aside the presumption of an intelligent agent responsible for writing the initial program as well as accept that natural events will change the code over time (evolution leading to genetic variation--the very thing we're trying to harness in the first part of today's lab). And no good tools exist for systematically debugging the genetic code. What would make genetic code easier to write? One idea is to make it a more “object oriented” language, defining units of known function that could be combined in standard and predictable ways. One effort to facilitate genetic programming can be found at The Registry for Standard Biological Parts. The Registry is a catalog of parts that describe basic biological functions. For example BBa_B0010 is the part number for a transcriptional terminator. The Registry of Standard Biological Parts makes its parts freely available to interested researchers and engineers, and allows registered users to add and annotate parts. To familiarize yourself with the Registry, you'll design a protein-generating device for E. coli. This device will consist of at least 3 parts from the Registry: an ORF, a promoter and a ribosome binding site (RBS). Try using the "catalog of parts and devices" (the leftmost icon here) to search for a part you'd like to use. Start your search in the "protein coding sequences" and then identify one of interest to you and your lab partner. What part number have you chosen? Follow the link to the data page associated with part. Is anything specified about its use or performance? Did you search by text, by part number, or by subpart? What worked and how well? What can you learn about the regulation of transcription from this part's number? part's name? part's information at the Registry? Follow the link to the data page associated with this part. Is anything specified about its use or performance? To find an RBS you should restrict your search to a set of the Registry's well-characterized ones from Chris Anderson's lab or the community collection, several of which are from Ron Weiss' lab. What part number did you choose? Can you anticipate the strength of this RBS in your three part construct? Why or why not? NOW: In plain English, what behavior do you expect for your three part construct? You should include this answer in your lab notebook and if you choose to do the optional "for next time" assignment, you can use this example as a point of departure for your discussion. Part of the usefulness of the Registry is that the parts conform (mostly) to a standardized assembly scheme. This scheme enables the same restriction enzymes to be used to physically piece together parts in series. The scheme does not ensure functional assemblies, however. If you have time before your cells are ready today or before the electronics exercise, then you can familiarize yourself with this "BioBrick™ assembly scheme." In this section, we'll explore the issue of gain and signal strength in the context of an electrical circuit. As you work through this exercise, consider how the lessons learned from experimenting with an electronic circuit would map to the engineering of biological systems. Many thanks to Tom Knight, Reshma Shetty and Barry Canton who motivated and designed an early version of this exercise. And a special shout out to Steve Wasserman for his guidance in redeveloping, troubleshooting and building this circuit to more directly reflect the experiment we're performing. Kudos also to Kelly Drinkwater, BE class of 2011 for her reworking of this material. The two terminals of the battery are labeled with a plus (high voltage) and minus (low voltage). When building a circuit, these are also referred to as power and ground, e.g. "To apply voltage across a resistor, connect one end of the resistor to power and the other end to ground." Never directly connect the two battery terminals with wire. This is called a "short circuit" and can damage or drain your battery. The OpAmp has one pin devoted to power and one devoted to ground. 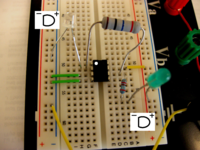 You will be building this circuit on a breadboard. Breadboards allow us to connect, disconnect, and move around circuit components easily and cleanly. It's much easier to build on a breadboard than to just wire everything together. But how do those little holes connect the components together? Let's take a look at the back of a breadboard. The back of a breadboard, with the sticky backing peeled off. Each of these metal strips connects a group of holes. You can plug two wires into two holes in the same group, and those two wires will be connected. Most of the holes are grouped in short rows of five. The holes on the sides, however, are connected in long rows, forming rails that run all the way down each edge of the breadboard. These rails can be used to conveniently deliver power to many places at once. 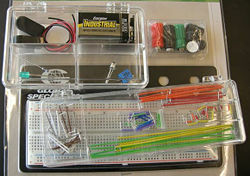 Begin with a basic circuit, to familiarize yourself with the breadboard and the LED. Examine the circuit diagram below, and then replicate it on the breadboard. Use the small (820Ω) resistor for this (stripe pattern: grey, red, black/brown, red). Circuit diagram. Circuit as built on breadboard. If you don't see light, check the direction of the LED and the battery, and make sure all the wires that should be connected, are connected. The resistor is needed to limit the current (rate of flow of electrons) through the LED. Too much current can damage it. The LEDs in your kit are strong enough that they won't burn out right away if you connect them straight across the battery, but using a resistor is still a good idea. The circuit you've built goes "power, LED, resistor, ground". It could also go "power, resistor, LED, ground". Set your multimeter to the 1mA (one milliamp) setting. Touch each leg of the photodiode to one of the multimeter probes. Shine a light on the photodiode and watch the current reading change. An integrated circuit chip plugged into a breadboard. Notice how each pin gets its own row of holes. If you plugged in the OpAmp in a different position, some of the pins would be connected to each other, and the device would not work properly; all the pins need to be independent. Notice the small circle/divot in the upper left corner of the chip, indicated by an arrow. It lets you know which way is up. The circle/divot always marks Pin 1. 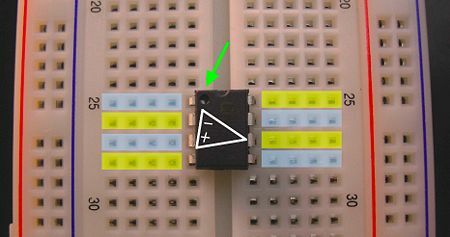 The triangular OpAmp symbol is drawn on the back of the chip, showing which pins correspond to the OpAmp's plus input, minus input, and output (described further below). Two of the remaining pins are for power and ground. 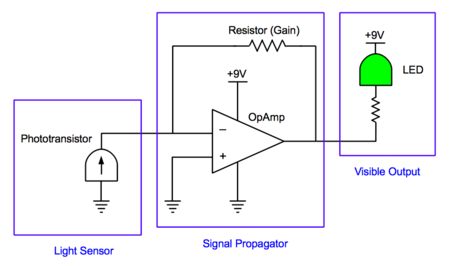 What does an OpAmp do? OpAmp is short for "operational amplifier". Essentially, an OpAmp takes an input signal and amplifies it in various ways, depending on how other components are attached to it. OpAmps are very versatile devices. In our case, we will use a feedback resistor between the output and the minus input, which will make the OpAmp act as a current-to-voltage converter. Recall that the photodiode produces only a very small current (a few milliamps) when light shines on it. The OpAmp's job is to convert that tiny current into a much larger voltage, which will drive the LED. How does this compare to the end of the computer simulation exercise, when you tuned the system with sliders? If you have time and would like to revisit Tinkercell, you can run additional simulations or gather more information about the system you're experimenting with. 1. Draft your Materials and Methods section for your Mod 2 research article. You can describe the strains and plasmids you've used, the mechanics of taking a bacterial photograph, the b-gal assay and the library screen as far as through the electroporation. The due date for this assignment will vary depending on if you are presenting a Journal Club article next time as well. If you ARE giving a journal club talk next time, then this draft is due before lab, one week from today. 2. If you are giving a journal club talk, the slides for your presentation should be uploaded to the Stellar website that is associated with our class. The presentation order will be determined by the order that your finished slides are uploaded. 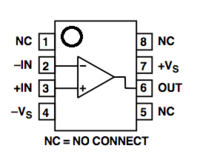 of the two types of circuits. This page was last edited on 27 October 2011, at 13:50.